Flea Market Finds is a self-published book that is core bound so it can lay flat. It contains general instructions and patterns for 2 quilts (1 is charm pack friendly) and 4 throw pillows (pillowcases can be found in Sleepretty book). 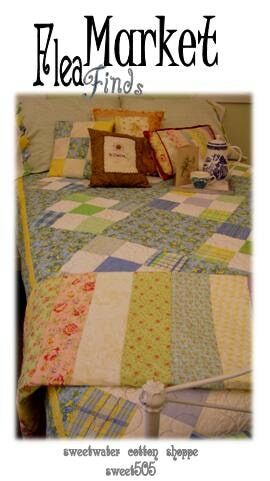 "He LOves me" and "Maple Nut" were pictured in the Spring 2010 issue of Quilt Sampler magazine. All patterns in the book were inspired by the flea market style that is gaining popularity today. Flea Market Find (pattern) is charm pack friendly. Patterns designed by Mickey Zimmer for Sweetwater Cotton Shoppe.